First off, I just want to say a HUGE thank you to my new blog friend Eric at Health Demystified. Eric was so kind in featuring me in his post Rising Stars in the Health and Fitness Blogosphere: 9 health and fitness bloggers who will entertain, inform, and inspire the world in 2012. Eric's blog is a wonderful look at health and nutrition with intelligent and entertaining writing. I would definitely recommend checking it out. Thanks again! I have a love affair with fresh citrus fruit. When I was in the marching band in high school, we had an annual citrus friuit fundraiser. It was probably one of my favorite times of year. My mom and I would order 40 to 60 pounds (to our defense, they only came in 20 pound boxes, and we like a variety) worth of different oranges and grapefruits. At the time, I really hadn't experimented with eating oranges in any other form then well, as an orange. Actually, I still don't really eat oranges in any other way than as an orange. 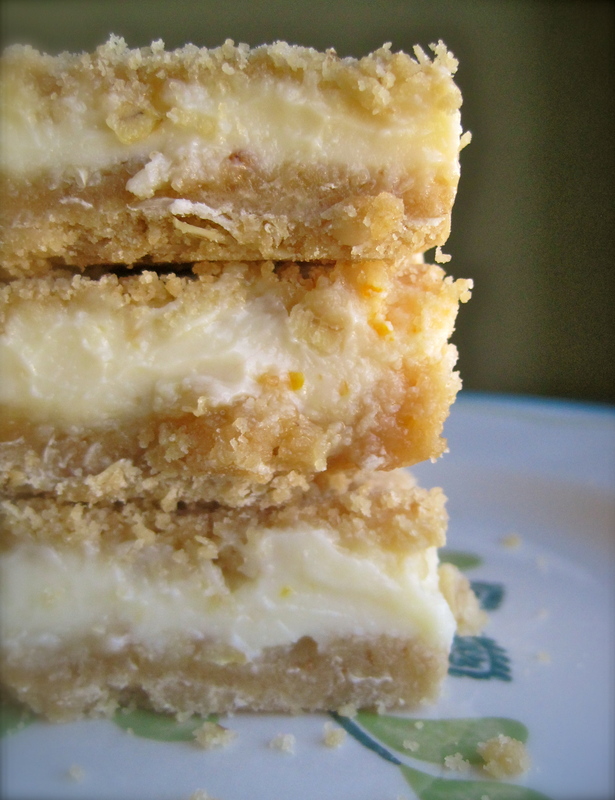 I was craving some creamy lemon bars that I saw on Pinterest (as I often crave anything with sugar, butter, and crumbly toppings). But, I had no lemons. I did, however have Cara Cara Oranges. If you haven't tried them, they are a gorgeous dark pink-orange color with a tart, almost grapefruity, flavor. 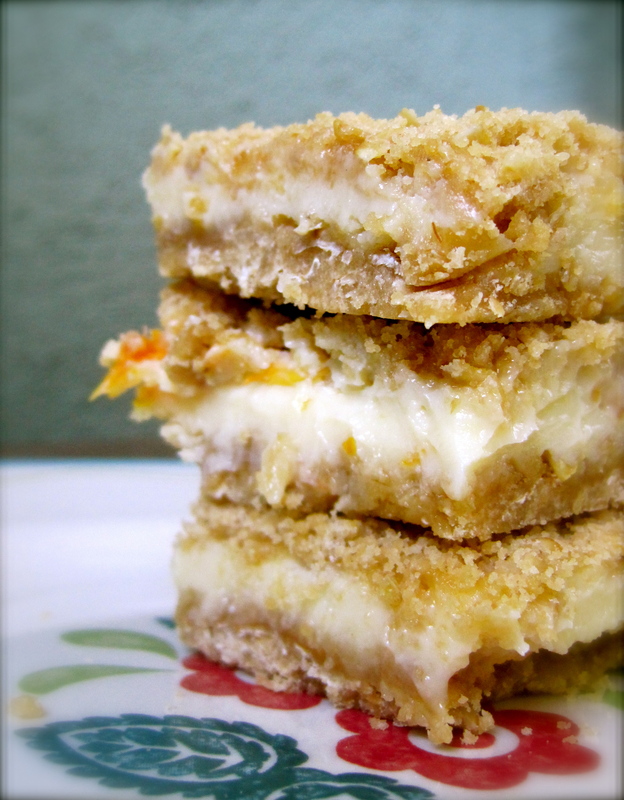 So I threw together these orange bars tasting hoping along the way that they would satiate my desire for a tasty citrus bar. The butter, sugar, oats, and flour come together to make a wonderful crust and crumbly topping. 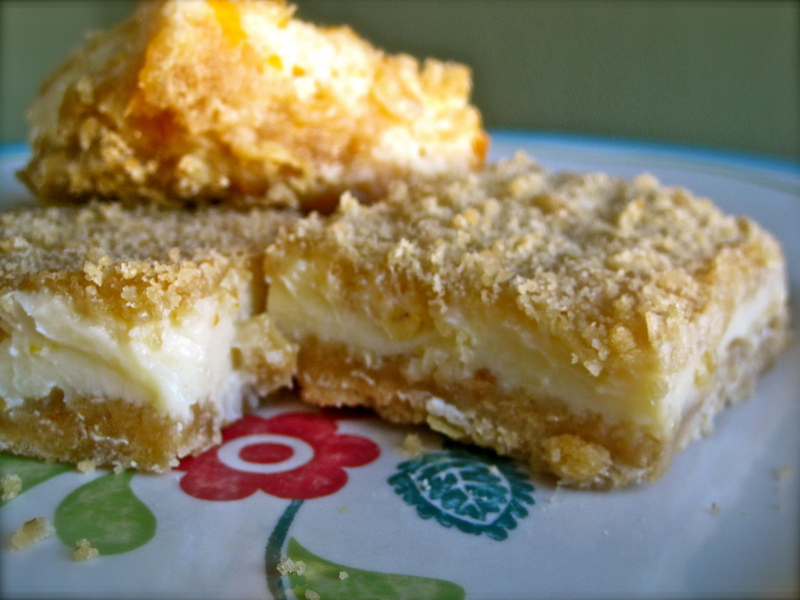 Sweetened condensed milk and orange give the center a creamy and slightly tart middle. This is the perfect treat. Enjoy these wonderful treats. Share them with your friends... Or not. 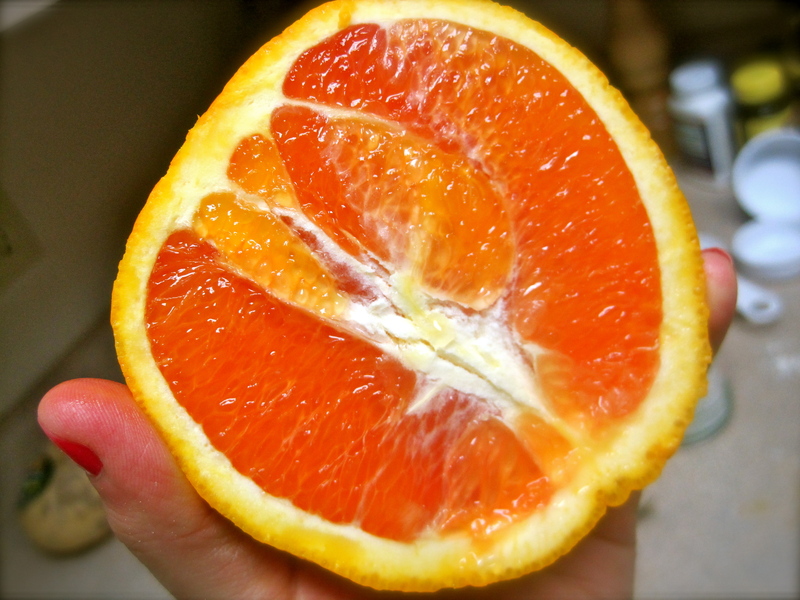 How do you eat your citrus fruit? 2. In a stand mixer or large bowl, beat butter and brown sugar until combined. In another bowl, sift together flour, salt, and baking powder. Add oats to the flour mixture and mix well. Pour oat and flour mixture into butter mixture and combine until a crumbly mix forms. Press half of the mixture into an 8 x 8 baking dish, set aside baking dish and remaining crumbly topping. 3. 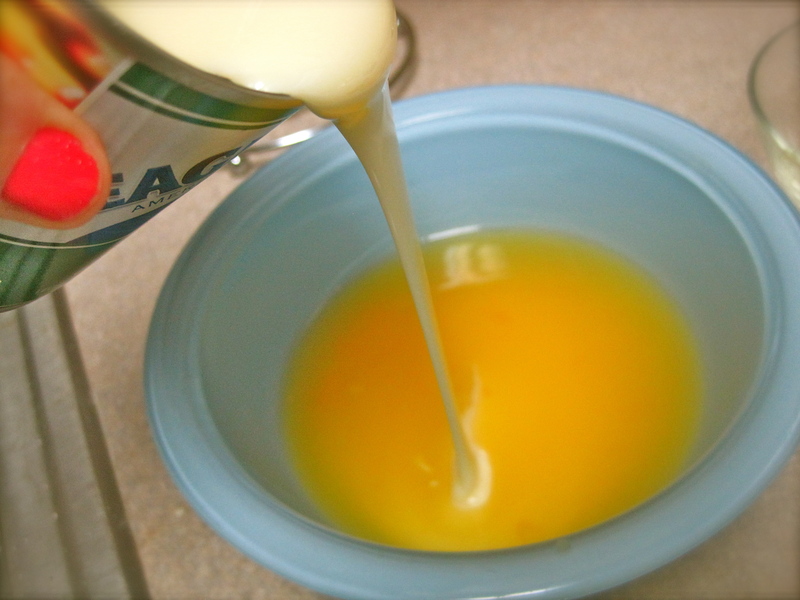 In a small-medium bowl, whisk sweetened condensed mix, orange juice, and orange zest until well combined. Pour wet mixture over crust. 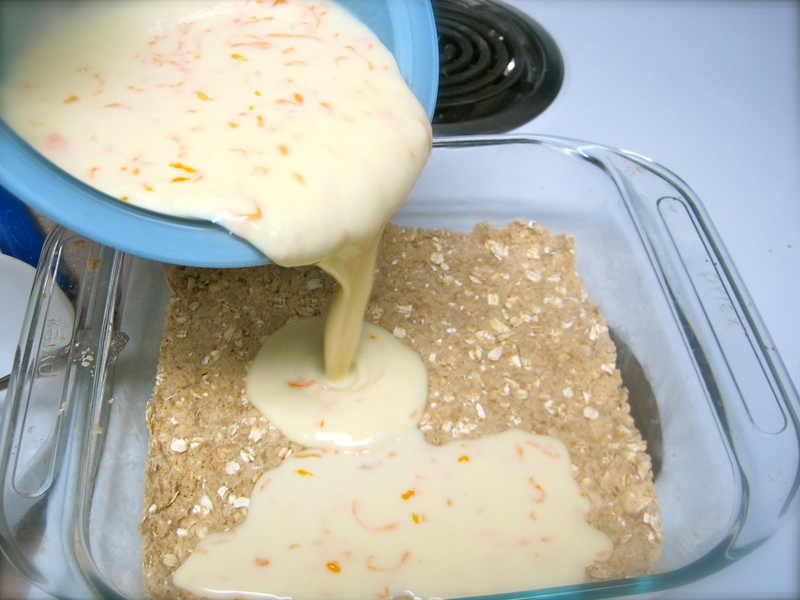 Sprinkle remaining crumble topping over wet sweetened condensed milk mixture. 4. Bake for 20-25 minutes, or until the topping is golden brown. Remove from oven and let cool for about 30 minutes. Move to refrigerator and allow to cool completely. Cut into desired size and eat all of them by yourself share.